"Why these "AUTOMOTIVE APPLICATIONS" and "MANUFACTURING LINE" dimensions?" An automobile component can be viewed either by its AUTOMOTIVE APPLICATIONS or by its PRIMARY INDUSTRY OF MANUFACTURING/PROCESSING OR THE RAW MATERIAL INGREDIENT BEING USED which we describe as a MANUFACTURING LINE. This, we feel will ensure flexibility to view and select the allied items, if necessary, in any of the dimensions, along with your interested item. Now let us explain the above example from your angle. Suppose you have clicked on the MANUFACTURING LINE FORGED COMPONENT and you find that you want to send us an inquiry on CRANKSHAFTS. At this juncture, our past experience suggests that you may also require other fast moving items of ENGINE PARTS along with the CRANKSHAFT. So we have facilitated our Website such that clicking on the CRANKSHAFT (while in MANUFACTURING LINE) will take you to the AUTOMOTIVE APPLICATION Listing ENGINE PARTS and there you can also order allied ENGINE PARTS LIKE CAMSHAFTS, GASKET KITS, MAIN & CONNECTING Rods etc. Now let us SEE THE REVERSE SITUATION. 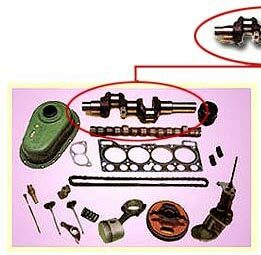 Suppose you have clicked on the AUTOMOTIVE APPLICATION ENGINE PARTS and you find that you want to send us an Enquiry on CRANKSHAFTS, here it may so happen that you may also like to order other FORGED COMPONENTS along with the CRANKSHAFTS. 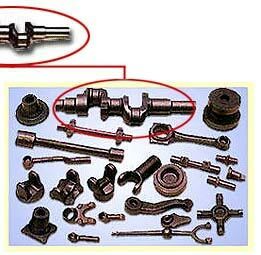 So we have facilitated our Website such that you click on the CRANKSHAFT (while in AUTOMOTIVE APPLICATIONS) will take you to the MANUFACTURING LINE listing FORGED COMPONENT where you can also order other FORGING ITEMS such as CONNECTING RODS, YOKES, CROSS HOLDERS, FLANGES, HUBS etc along with the crankshafts. Like wise all our products are having two dimensions Like an Engine Mount can be from under the AUTOMOTIVE APPLICATION Engine Parts and also in the MANUFACTURING LINE: Rubber parts. Clicking on the name 'Engine Mounts' in AUTOMOTIVE APPLICATION Listing takes you to the MANUFACTURING LINE: Rubber Parts, which is the other dimension of the Engine Mounts.